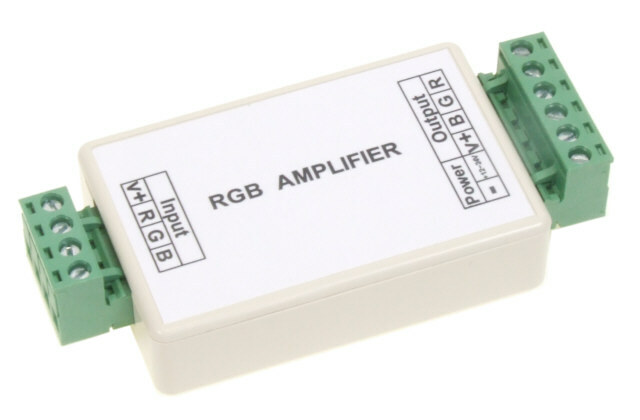 A RGB amplifier is only needed when you want to use more than 10 meters of RGB strip connected in series. Without an amplifier there will be noticeable difference in color hue an intensity, caused by voltage drop. If you are really very picky about color and intensity differences, it is advised to use an amplifier between every 5 meter sections. The amplifier is connected at the end of a section and is connected to its own 12V power supply. The outputs are connected to the new section added. This way, color and intensity are copied from the first section. Same colors and same brightness. The control remains the same, set the colors with the controller that drives the first section.